Robert Wright is a Collinsville native and graduate of Collinsville High School. After graduating, Robert attended the University of Illinois at Urbana-Champaign, earning his Bachelor’s in music education. While at the U of I, he played trumpet in multiple symphonic bands, the marching Illini as well as principle trumpet in the University of Illinois Wind Symphony. Robert was also a drum major for the “Marching Illini” in his senior year. Robert worked with the Collinsville High School band in 2009 during the interim period between Jeff Valperts and Joe Padawan. He focused on marching fundamentals as well as working with individual sectionals. 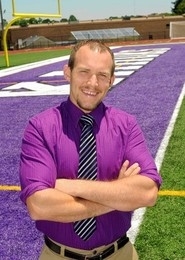 From 2010-2012, Robert worked as a brass technician with the O’Fallon Township High School marching band. Throughout his time at O’Fallon, he worked extensively with brass sections while maintaining instruction of marching and music fundamentals for the full ensemble. Robert also student-taught at OTHS, gaining experience in teaching all levels of ensembles in concert, marching, jazz and pep band settings. Mr. Wright has overseen the Collinsville High School Band Program since the 2012 Season. His connection with the students and extensive knowledge of both teaching and music theory is a credit to the Collinsville, IL community and to Collinsville High School. The Band Parent Association and students look forward to his many years of providing the highest level of commitment and music education possible for the students of CHS.